I’ve not been keeping a very careful tally of my blocks lately. Truth be told, I haven’t used my sewing machine an awful lot. I’ve mostly been at the longarm. And I’m still way behind at that! I nearly re-counted blocks I had already counted, and have been hard pressed to remember exactly what I did work on this past month. I went to a retreat, so I should have something to show for it, right? Retracing my steps from the retreat, I came up with 28. 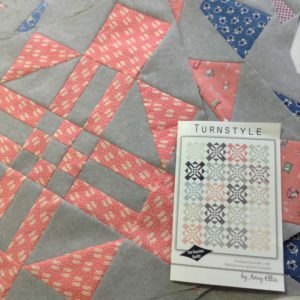 I made 25 blocks for the mystery quilt my guild is doing, and I made the final 3 blocks for my Turnstyle quilt (from an Amy Ellis pattern). Now to get all that set together! Now it’s your turn to let us all know how you did this month on block making! Leave a comment with your total and I’ll do my best to keep the Project Page updated (another thing I’ve had a hard time keeping up with). As always, double check to make sure I have your total correct. This month, we’re doing yet another 30 blocks for a year-to-date total of 290. Only 3 more months to get to 350! Some of you are way past that. I’m hoping our group totals this year are bigger and better than last year’s totals! The monthly prize winner for August is Elaine, who so far has a total of 84 blocks. Elaine was at the same retreat as I was, sewing up a storm, so I’m waiting for her to give me a new tally. I know she’s done some more! And as an extra added bonus, I’ll leave you with some of the funny quotes that came from said retreat. I hope you get some laughs out of them like we all did! A slow month for me. Sept seemed mighty long for some reason. I made 65 blocks this month. I did a grand total of 8 blocks this month. But, my swapping obligations are almost done so I will have more time to work on stuff soon. . . .so hopefully my numbers will go up (fingers, eyes, toes, etc. all crossed! LOL). After being ashamed of the 16 count, I worked more and am happy to report a total of 21 for Sept. !!! I made 224 blocks in September. I only completed 7 blocks this month! 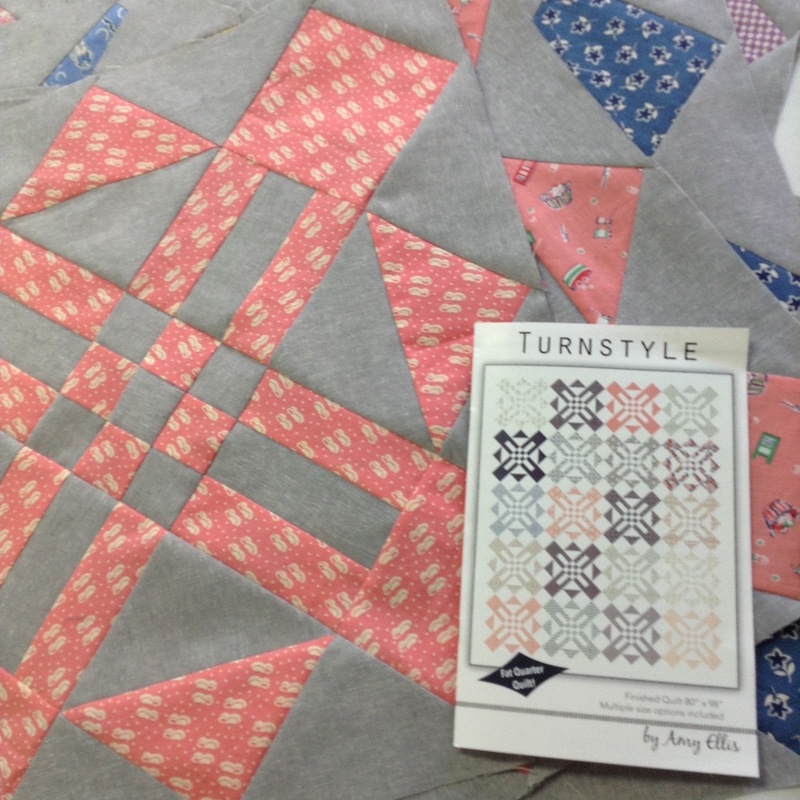 My first time to be a tester of paper pieced patterns. They had seven blocks for us to test. It was a very neat experience to be behind the scenes and help the designers with their patterns. I quilted two quilts so that took up most of my September. I got 56 this past month. Your quotes are hilarious! I hope you can join us at our retreat next August and keep track of them for us again, like you did last year! Add 39 blocks for Sept for me – 3 practice blocks so make that 41. . Most from my commission quilt and the rest blocks from my two leader and enders projects. This month I managed 43 blocks. Zip,zilch,zero. Thank goodness I’m already double what I need for the year. October is retreat month for me and I already have six quilts cut out and ready to go plus a paper pieced wall hanging class. Big number next month! September Report: 28 blocks here, too. Thank goodness for setting squares! Always enjoy the retreat quote part. You have some raunchy ladies there! I completed 78 blocks for September. Bad month for allergies. Eyes really bothering me. And…it seems to be continuing in the month of October. Hope it all clears up soon. 92 blocks for me. Although I did a lot of sewing not much quilt making. 350 for September. My basement was finished and I made great use of it. I made 21 blocks in September for a total of 531. Not bad for being in the middle of a kitchen remodel and not having time to sew. Okay so I made 41 blocks in September. For a total thus far of 455 this year. Which is actually better than I would have expected. I made 38 blocks in September, which is a lot for me! I made 26 blocks this month, bringing my year total up to 239. Intending to get back to focusing on block making this month, but then I thought that last month too! Well, it sure isn’t hard to remember when you only make 3. Yep, three. But I have lots of stuff primed and ready and next month will be different. 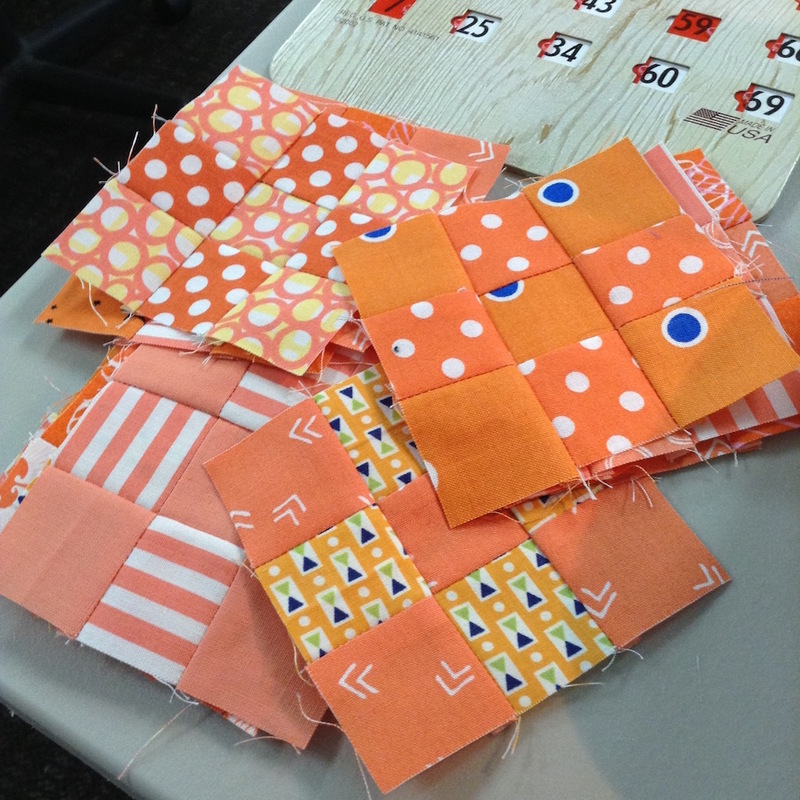 Parts cut and some already pieced………..now just make the blocks. Yoo -hoo!! 26 blocks this month, not much time to sew. But I am ahead of my goal, so hopefully I’ll make it to 350 by year end. None for me this month. My excuse is there was not a sewing area in my hospital room!! I can easily do better this month since I am now home. 51 blocks for me. They are adding up fast! I broke 350 with a total of 361. Thanks for the inspiration. I think I’m at 675 for the year. I’ve got to hustle before my due date in December. I finished 39 blocks in September–thought it would be more–I feel like I was more productive than that!! 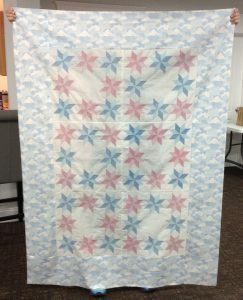 I also finished one quilt, but have 7 more that I want to finish by the end of the year–yikes!! I’m quite pleased on progress of my UFOs. 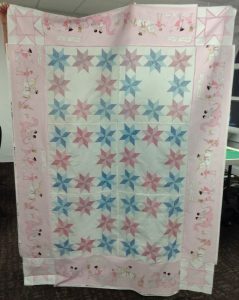 Quilted and gifted a twin size quilt, finished 4 table runners, quilted one and made 24 blocks. Only one block in Sept. You had a good month! Not much sewing going here but I did manage to get a meager 36 done. 🙂 Hoping to get my little girl’s winter dresses slammed out quickly so I can get back to working on quilty Christmas presents. Nice photos, your mystery block looks like fun. Thank you for sharing. I managed 117 blocks in September! Just 3 for me, and that’s because I did them on the evening of the 30th! I couldn’t let the month end with nothing. I was supposed to be only quilting in September, oops. I made 66 blocks – 24 Heartstring, 12 Pieces of Eight, and 40 Tula Pink City Sampler. 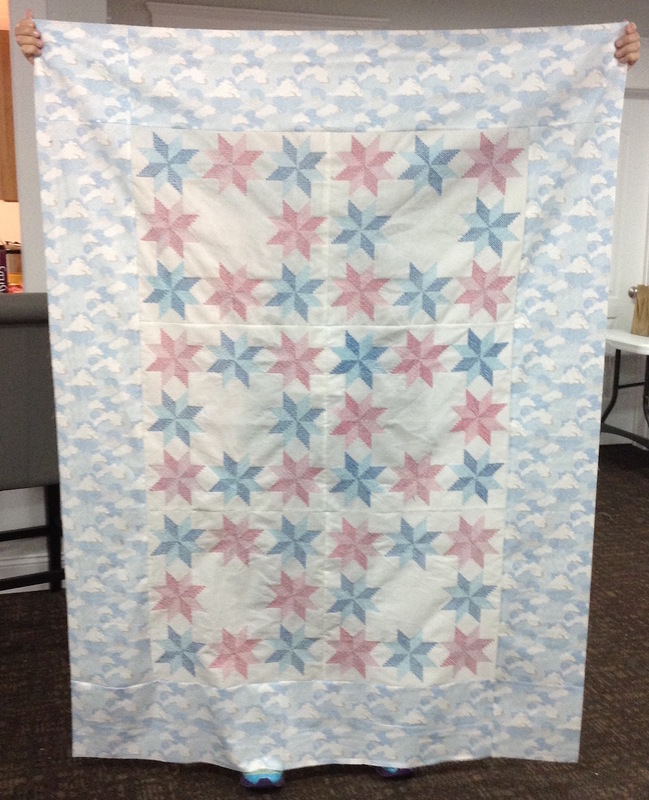 I did get one donation quilt finished, quilted and bound. 36 blocks for me in September. I know exactly what you mean about losing track of what you’ve been working on. I try to take a picture when I finish a block so I can look back through those and figure it out. If I missed any pictures this time, I’ve already forgotten about the blocks! I didn’t check in last month, so I’m reporting for two months. I completed 110 blocks in August and 6 blocks in September for a total of 220 this year. I completed 101 blocks for September. 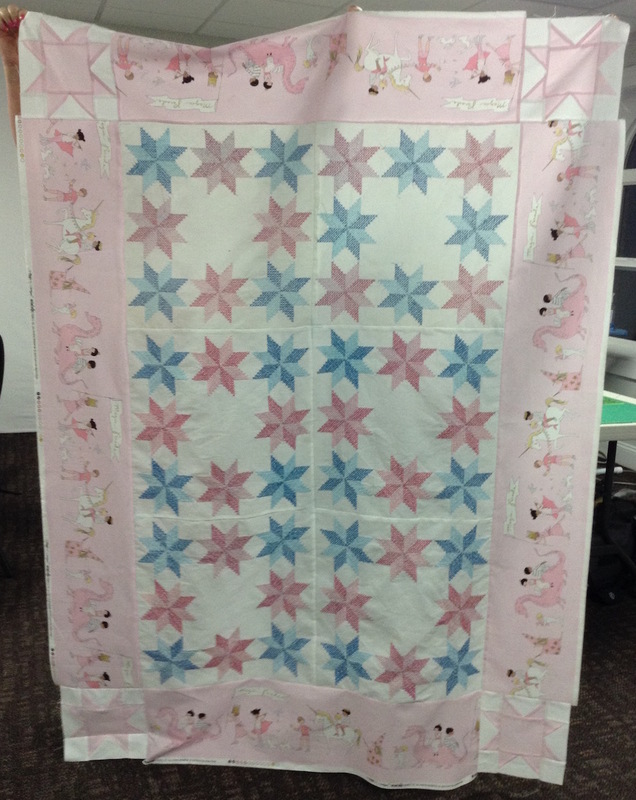 one included a quilt from start to finish for the top. It is also quilted, I just need to bind it.